I bet if you go into your pantry, you will find more than a few packets of jelly crystals. I’m right, aren’t I? When I’m living in Australia, I normally have at least at least 5 packets of jelly crystals in the pantry. There are just soooo many flavours, I just want to get one of each! Now that I’m in Singapore, I’m much more reserved with my jelly purchasing, only 1-2 boxes at a time. Have you guessed the core ingredient of today’s recipe yet? Hmmm…. Jelly isn’t a pantry staple for nothing. It’s always handy to have in the cupboard for desserts, baking, cake decorating, or to make up for when somebody in the house has a sore throat. But like I wrote above, sometimes we just have too many packets in the pantry and it’s good to use them up in a quick and easy way that’s not the standard wibbly-wobbly style. 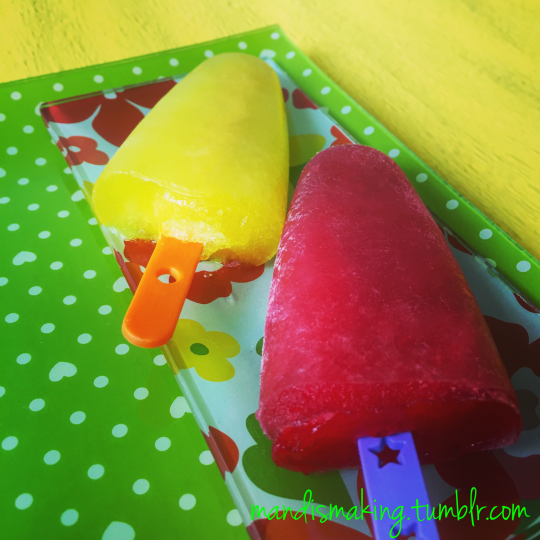 In case you’re wondering why you would turn a box of jelly into icy pops, this is the reason right here; they don’t melt as fast. The gelatin holds it all together, and keeps the pop from dripping too fast. Which is great, considering that the MM family live just above the equator and ice dissolves in under 10 seconds. ‘Mandi, haven’t you made this before?’ Well, I made something similar. Last year I made Elsa’s Icicles, which were just jelly and fizzy drink. This time, I’ve tried to make them a little bit healthier. Now, here’s a bit of back story on how this recipe came about. Over here in Singapore, we don’t have Aeroplane Jelly. We have a local brand, some agar-agar and konnyaku based ones, and we have the American Jell-O. I started getting Jell-O for Miss G, but then decided to save a few cents and try out the local brand, only to find out that the local one doesn’t dissolve as well as the Aussie and US versions do. I would be left with some goopy leftover gelatin residue in the bottom of my measuring jug, no matter how much I whisked! I decided to go back to the more expensive brand for jiggly purposes, but I was left with a couple of boxes of the cheaper stuff in the pantry. Not wanting to just chuck them out or leave them there, I decided to turn them into pops. 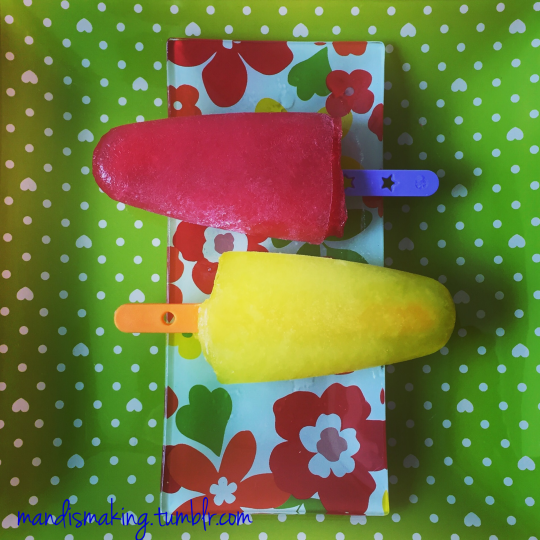 I added the juice as a way of getting some extra fruit and vitamins into our diet, and as a way of thickening up the ice pop mixture. CTO and Miss G loved them and I make a new batch at least once a week! All you need for this is 1 packet of jelly crystals (approx 85-90g a box, or 3oz if you use imperial measures), boiling hot water, and some juice or coconut water! Nice and simple, and you can whip this up in minutes, the exact same time it takes to make a normal batch of jelly! When I make these with juice, I prefer to use 100% fruit juice in a UHT carton just to pinch a few pennies, but you can use fresh juice or refrigerated if you prefer. The juice does make the pops sweeter, so if you have problems with sugar intake, these may be an occasional treat. Or if you don’t want it to be overly fruity, you can add coconut water instead! It’s extremely hydrating and full of minerals, like a natural Gatorade/Powerade without all the extra nasties. It’ll kinda turn your pops into a weaker yet cheaper DIY Hydralyte. Like I wrote above, I use these as a way to tempt my toddler to up her fruit intake. You can even use a fruit and veggie juice blend like V8 if you want to sneak in a few more veggies into your kids meals. This is also a good recipe for older kids to make, it’s just measuring, whisking/stirring, and pouring. Bottom line, if your kids make jelly alone or with you at home, they can make these. Again, this recipe does contain boiling hot water so keep an eye out if they do! Feel free to experiment with jelly/juice pairings. Mix up your favourites and try some new ones! The pops I have pictured here in the post are strawberry/mango juice and pineapple/coconut water. I’ve done other pairings like lime/pineapple juice, tropical/punch, raspberry/orange juice, and blackcurrant/apple juice. 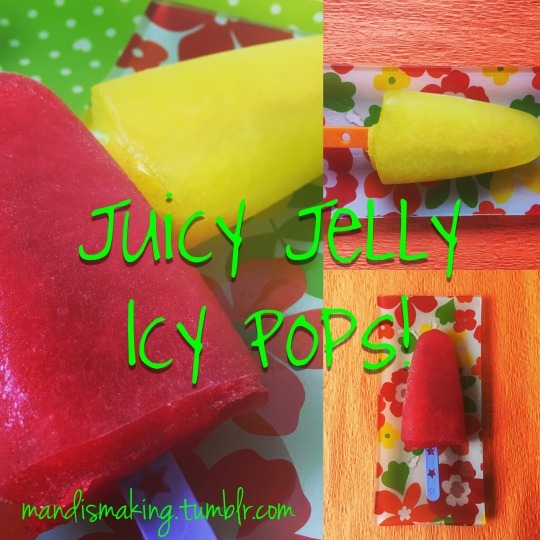 So, spend a few minutes and empty your pantry of your extra jelly packets and whip up a few of these pops for snacks and desserts! In a heat-proof measuring jug or bowl, dissolve the jelly crystals in the hot water with a spoon or a whisk. Once dissolved, pour in the juice/coconut water. Pour into moulds, add sticks and freeze until set.